One of my favorite followers Angie has awarded me with a Stylish Blogger Award! YEAH my first award! Thank you Angie! I love visiting Angie's Blog http://invitationsonly.blogspot.com/ and her sister Ash's Blog http://cricut-crazed-lady.blogspot.com/! Creativity really runs in that family!! 4) leave a comment so that they can pass along the recognition! 1) I am actually a very shy and private person so I thought sharing 8 things about myself would be really hard. The fact that I started this blog and that I share so much on it surprises me! I guess it is easier to write when you cannot see or hear the other person's reaction. I have a hard time talking to people face to face and I often feel like people think that I am stuck up but I am really just too scared to talk to them! I seem to have no problem rambling on and on here. This blog has become my free therapy. 2) My husband really is my best friend. I am drawn to him because he reminds me of my Dad and most Daddy's Girls marry someone like their father. He was one of my older brother's friends so I've known him for a good portion of my life. He and I have been really good friends for 16 years, together for 11 years, and married for almost 6 years. I feel like I've been pregnant most of the time since our wedding day. We have a soon to be 5 year old, a 3 year old, and a one year old, all girls and everyone says we are in for some trouble. 3) My sister is also my best friend. I could never choose between her or my husband. I talk to her almost everyday and I wish she lived closer. She is 17 months younger than I and our relationship is why I had my two oldest so close together. I wanted my daughters to always have their best friend with them. The one thing that worries me is that they have to live together! My sister and I grew up in different houses, she lived with our mom and I lived with our dad so maybe that is why we are so close. 4) I became a stay-at-home mom 8 weeks after my second child was born. It is the best decision I've ever made! I felt guilty that I missed my first child's entire first year of life because I worked all the time. She was the first kid dropped off at her daycare everyday and she was usually the last one picked up. I just couldn't do it to the second child. 5) I do not own a cell phone....GASP!! Can you believe it! Everyone I know harasses me about it but I do not want one anymore. I had mine disconnected a month after becoming a SAHM because my employees continued to call me constantly for help. I lived with that thing permanently attached to my ear for too long! I had to disconnect and I've never regretted it! 6) The three women who I look up to most in my life are my three Mom's.. Yes, three of them. My step-mom who I grew up with and it surprises me how so many people think she is my real mother; my mom who I lived away from for half my life but has been around a lot since my children have been born; and my mother-in-law who has been a very good friend for a good portion of my life. I have a very special relationship with each one of them! 7) I have paper stashed in EVERY room of my house, not because I have to hide it (because my husband is well aware of my addiction) but because I do so much with it. It doesn't all fit in my craft area and we do paper crafts so often around my house. I am a Stampin' Up! Demonstrator but I am a Hobby Demo meaning I do it for the discount... for the paper of course. I do have my faithful friends who come over for classes and crops but I do not pursue the business. I DO IT FOR THE PAPER!! 8) My father just passed away a few weeks ago, days before Christmas. I am a Daddy's Girl and I can't even put it into words how very special he was to me. I miss him terribly and after his illness/passing, I still find that I cannot sleep. That is why you see my comments/posts at all hours of the night. I craft and blog to keep my mind busy 24/7 so I do not have to think about it. I do not talk about it and you may never see anything about it again on this blog. Wow, did I actual share all of that. Well, now that it is out, I am leaving it there! Maybe my next hobby will be writing a novel because I have no problem writing! Now for the 8 other individuals that I have recently discovered that I would like to pass this on to. I had a hard time with this, not because I couldn't find anyone (I would love to give it to almost every blog I come across) but because I really want to share the love by giving it to people that have not received it before, several whom are new bloggers like me! I started with anyone who had ever left one of their sweet comments on my blog and then went through all my followers to find fellow blogger friends who do not have this award already posted on their blog. They are all very talented so make sure you check them out! Thank you for sharing your awesome work. You are all inspiring! Thank you Angie as well as everyone else for your comments/support and keep sharing the love ladies! Thank you for choosing me for one of the recipients of this award, but because I am so new to blogging, I don't quite know how to put the award on my blog. I would love to though! Wow I read every word. And you are so right we do have ALOT in common! Congratulations on the award. You totally deserve it. I LOVE LOVE LOVE looking at your work. I actually laughed when you said people may think you are stuck up because they always tell me that was their first impression of me. HEHE Anyways...Congrats. I was also chosen by Angie for this award too and wanted to thank you for stopping by my blog and leaving such a sweet comment. Glad you did, cause now I know about your blog. Love the projects you have made and can't wait to see what else you come up with. I just became a follower. 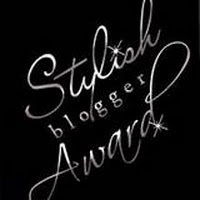 Amber, Thanks so much for choosing me as one of the Stylish blogger Awards. You certainly have made my day. I'm so sorry about your dad. Thanks again, and take care. Hey Amber! Thanks so much for your help with posting the award on my blog. I just got it figured out. YEAH!! !